This slick, impermeable garment is worn over other clothes and provides chemical protection equal to its rating. If worn with chemical-resistant armor, only the highest chemical protection rating applies. 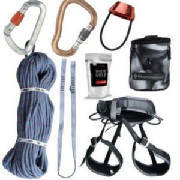 Climbing Gear: Includes an ascent/descent harness, gloves, carabiners, crampons, and so forth. Gecko Tape Gloves: These gloves are made of a special dry adhesive that incorporates millions of fine microscopic hairs that bonds to other surfaces. Individually these bonding forces are insignificant, but when combined, they are strong enough to stick a troll upside-down on a ceiling. Gecko tape gloves come as a set that includes gloves, kneepads and slip-on soles. A character using them is treated as if she were performing assisted climbing. These gloves are useless when wet. Rappeling Gloves: These gloves are made of a special fabric that allows the wearer to get a tighter grip on a grapple line, giving her a +2 Strength bonus on all tests to hold her grip on the line. These gloves are necessary in order to use ultrathin microwire. Grapple Gun: This gun can shoot a grappling hook out to 75 meters. It comes equipped with an internal winch, to pull back the grapple (or pull up small loads). Use Exotic Ranged Weapon skill to wield this as a weapon; grapple gun attacks are resisted with Impact armor. Micro rope can support a weight of up to 2,000 kg; all other ropes can support a weight of up to 4,000 kg. Microwire : This micro rope is made of an extremely thin and resilient fiber, so a great length of it can be stored in a very small compartment. On the downside, it can only be grabbed with special protective rappeling gloves, otherwise it will cut straight through the climber’s hands (inflicting 8P damage). Myomeric Rope: Made of a special myomeric fiber, this rope’s movements can be electronically controlled (over a maximum length of up to 30 meters)—for example, winding like a snake to reach around an obstacle or to tie to a ledge. The rope is not very strong, so it cannot be used to restrain people or pick up large objects. Stealth Rope & Catalyst Stick: When stealth rope is touched with the catalyst stick, a chemical reaction is triggered that causes it to crumble to dust within seconds, leaving (almost) no trace. The catalyst stick is re-usable. This underwater equipment includes a partial face mask with snorkel, a breathing regulator, an air tank with 2 hours of air, a wet suit, and a buoyancy compensator (an inflatable vest that can be used to send a diver to the surface when she can’t get there on her own). 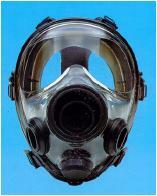 The regulator and air tank protect against inhalation vector toxins just like a gas mask. The wet suit provides a +1 dice pool bonus for resisting Cold damage. Completely covers the user’s face and filters out toxic substances. It provides a bonus of +2 on toxic resistance tests against gas substances. Cannot be combined with a respirator. This device measures signals received from either wireless access points or GPS (Global Positioning System) satellites and triangulates the user’s exact location (plus or minus 5 meters). Commlinks do this automatically in wire-less environments, of course, so GPS units are primarily used in the wilderness or areas without wireless coverage. The hazmat suit covers the whole body and includes an internal air tank with 4 hours of air. As long as it is not damaged, it provides the user with a chemical seal and protects contact and inhalation vector toxins. Even if breached, it still provides several points of chemical protection (gamemaster’s discretion). Modern flashlights use long-lasting superbright LEDs. Durability and brightness depend on the size—the bigger, the better. Also available in low-light and infrared versions, reducing Visibility modifiers for low-light and thermographic vision, respectively. Bend, snap, and shake it for a couple of hours of chemical light. Micro Flare Launcher: The flare launcher can shoot colored flares about 200 meters into the air, illuminating an area the size of a city block for a couple of minutes and negating the modifier for poor or low lighting. If wielded as a weapon, use Exotic Ranged Weapon skill; the micro flare deals Fire damage. Magnesium Torch: Activate for 5 minutes of bright torchlight. A respirator is a filtering device worn over the mouth and nose that protects against inhalation-vector toxins. The respirator adds its ratings to toxin resistance tests.